Reporter: Say listen, is he working on a case? Nora Charles: A case of scotch. Pitch in and help him. In his lush waltz time (or maybe a fox-trot), he’s gulping his wife’s drink down before passing her the empty glass, to which she takes with amusement. She, as in Nora Charles, drinks too, with merriment and style and with routine like Nick, and she also consumes liberally, almost as much or as much as her husband. It’s not too hard to keep track of who drinks the most as it would appear to be Nick, though he may just be seen onscreen imbibing with exceptional volume. I have no idea how much Nora’s putting away during her walks with Asta, their pet terrier. Anyway, it doesn’t really matter – they both drink enough and with such brio, that Who’s Afraid of Virginia Woolf’s George and Martha, had they been around, would raise their glasses to them as kindred dipsomaniacal spirits. But George and Martha, as intelligent and as morbidly funny and as mean and finally, as poignant as they are, could never contend with Nick and Nora Charles. Nick and Nora would roll their eyes and throw down a wicked bon mot over their “Hey, swampy” insults – for they’re never sloppy or mean or ugly about their drinking – and think of the bemused looks they’d give one another around George and Martha’s “truth or illusion.” (I am imagining Nick and Nora in George and Martha’s academic abode, sitting on that couch, laughing when George busts out that umbrella gun, and then wanting to leave because they’d rather drink in their sterling, silvery apartment, crawl into their silk night clothes and order in a “flock of sandwiches,” and then drink more). So, George and Martha could never “get” them as guests. You can’t get people who are that shimmering and witty while drinking – a happily married couple and who aren’t shocked by profuse alcohol consumption. Maybe they should be frightened those two could represent their future but… let’s not spoil things here, and, they’re not thinking of that. Nick and Nora, a real team, are in love and live life entirely the way they want to – they’ve created a world of their own that’s sophisticated and mischievous and intelligent and funny and full of adventure, and, yes, beautiful clothes. And the correct intoxicants. And crime, buffered by their glittering bubble. As such, they appear to be one of the most positive and positively happy couples in filmdom. A marriage of equals. And two playful quick-witted lovebirds who, as I’ve stated numerous times here, drink a lot. This glamorous twosome are William Powell as Nick and Myrna Loy as Nora, in W.S. 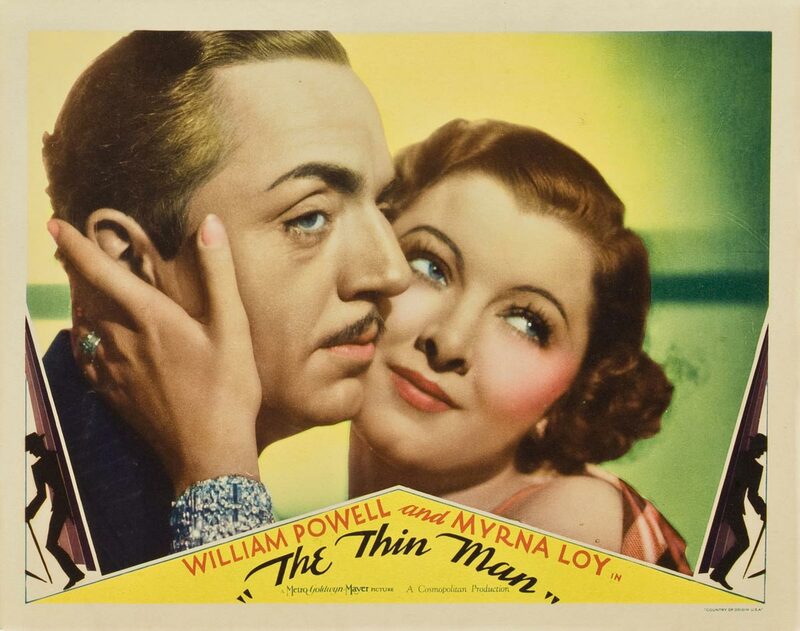 Van Dyke’s The Thin Man, an exceptional merging of mystery and seminal screwball and modern marital allure, adapted from the popular Dashiell Hammett novel (his last), who also drank (in an understatement). 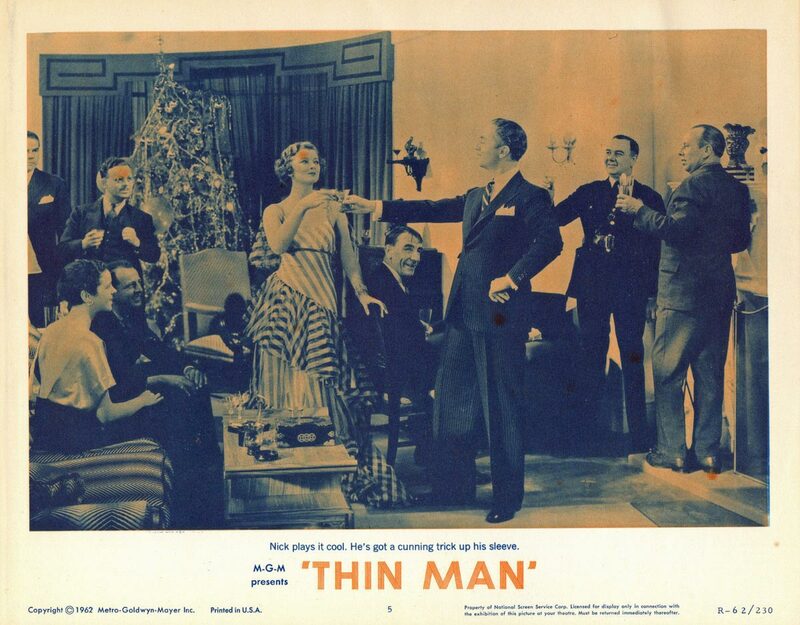 It’s said that Hammett’s relationship with playwright Lillian Hellman was the inspiration to create these heavy drinking characters, and likely so, but The Thin Man is a much more idealized version of the Hammett-Hellman union and the drinking. Screenwriters Albert Hackett and Frances Goodrich were a married couple, and they lightened up the darker edges of the novel, and perhaps their own marriage played a part (wouldn’t we all want to be Nick and Nora Charles?). Still, as Hellman wrote of Hammett in the New Yorker, after his death: “For years we made jokes about the day I would write about him. In the early years, I would say, ‘Tell me more about the girl in San Francisco. The silly one who lived across the hall in Pine Street.’ And he would laugh and say, ‘She lived across the hall in Pine Street and was silly.’ ‘Tell more than that. How much did you like her, and—?’ He would yawn: ‘Finish your drink and go to sleep.’” Nick would tell Nora the same, except he’d “gallantly” finish her drink for her. We first meet Nick at a bar talking fox trots and waltzes when it comes to creating cocktails – he’s only slightly slurred in his speech, not quite lit and immediately charming as William Powell always is. (The word charming seems almost needless when you simply read his name – if you know William Powell you already know he is.) He comes face-to-face with a young woman, not his wife whom we’ve not met yet. Gasp! No, no, it’s nothing like that and Nora wouldn’t bat an eye anyway. She trusts her husband or she’s perfectly fine with a flirt. One life to live and all that. Also, he’s a little tipsy. This woman is lovely Dorothy Wynant (Maureen O’Sullivan), who remembers Nick back when he was a full time employed detective, back when she was a little girl: “You used to fascinate me, a real live detective. You told me the most wonderful stories. Were they true?” He answers, “Probably not.” Nick once worked on a case for her father (the titular “thin man” which sounds so ominous), and now he’s gone missing. She’s worried, he was supposed to be around for her upcoming wedding, it’s nearing Christmas and… she has a strange family. Dorothy’s father, Clyde Wynant (Edward Ellis) who is sweet to her but not so lovable in real life (or at least he chooses shifty romantic interests) is divorced from her somewhat ridiculous mother, Mimi (Minna Gombell) and is in a rocky relationship with his two-timing secretary, Julia (Natalie Moorhead), who keeps company with some shady-looking so-and-sos. Naturally there are problems, and both ex-wife and girlfriend are concerned about his money which raises suspicion. Meanwhile, Mimi has re-married some deviously handsome fellow named Chris (Cesar Romero) who doesn’t work and is sensitive to his idle pointed out (“You’ve hurt his feelings!” Mimi exclaims), and her son, the Leopold and Loeb-looking Gilbert (William Henry) is a strange kid who likes to spy on people, listen in on phone calls (when accused of eavesdropping, he says, “Of course. 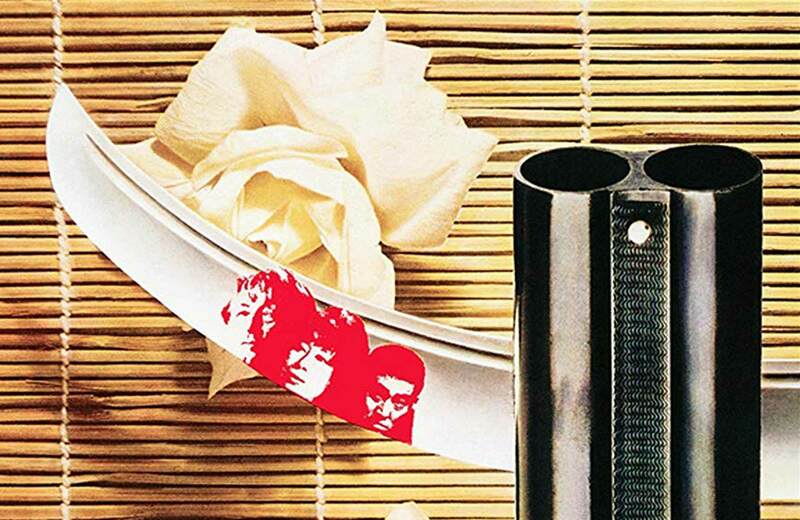 What’s an extension for?”), digging into the gory details of true crime and then, the more dramatic parts of Freudianism – the Oedipus Complex and a mother fixation, of which he states he has. (OK, so he’s not that weird – not by today’s standards anyway.) This is the family Nick and Nora will get dragged into, somewhat (no one can really drag these two anywhere), after the retired detective decides to take on the case and digs in deeper after Julia is murdered. Now the father is not only missing but the prime suspect as well. This all happening around the flurry of Christmas parties and cocktails and drunk friends calling their mothers and strange men showing up at the door in the middle of the night, Nick and Nora contend with a family so screwy that no one in it needs to drink to appear under the influence. In the novel Gilbert is experimenting with harder drugs like morphine and curious about cocaine (“that’s to supposed to sharpen the brain, isn’t it?” he asks) and though there’s not a mention of that in the movie, you can imagine quite a few of these characters snorting or injecting something illicit as they bounce around the rooms. But Nick and Nora just drink – and with unflappable tolerance. After all, the 21st Amendment to the Constitution was passed the year before in 1933, thus ending national Prohibition, so, drink away! 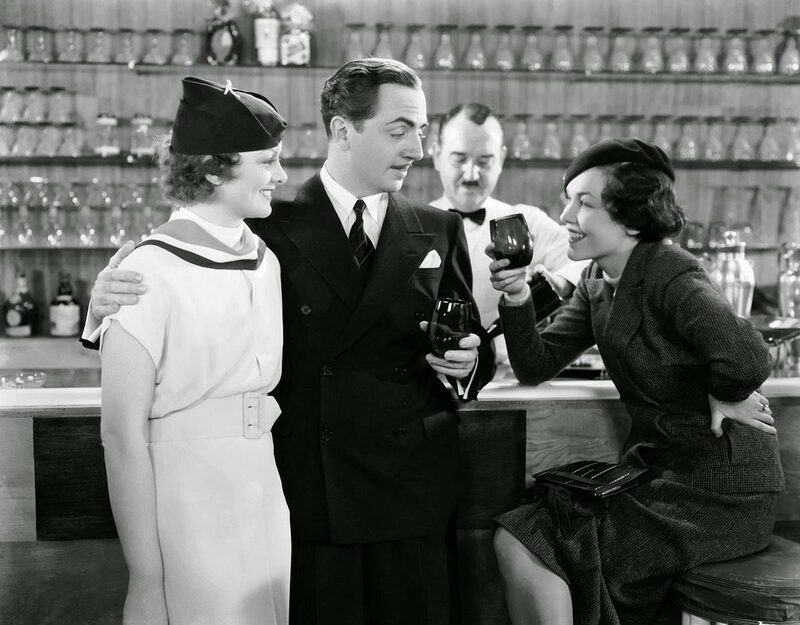 Of course, Nick and Nora always drank as everyone did under Prohibition, but never mind that, celebrate! Celebrate more. And have another. Have six, and order five more as Nora does when she is finally introduced in the picture. And what an introduction – she comes into the bar with Asta (Skippy) in tow, arms full of Christmas presents, and falls flat on her face. Elegant, gorgeous Myrna Loy takes a tumble and manages to be elegant and gorgeous about it. And funny, with a timing and wit all her own. She also walks in on her husband’s impromptu meeting with his pretty potential new client, Dorothy, and is amused by the possible job. You see, these two don’t need to work since, as Nick jokes to his wealthy wife, “I’m too busy seeing you don’t Iose the money I married you for.” But Nora is up for the thrill and for the seedier amusements of life (“Oh, Nicky, I love you because you know such lovely people.” she says with loving sarcasm) and she wants to help out poor Dorothy. Eventually Nick will relent and, as the complicated case continues on, Nick and Nora never abate with their merry lives, throwing one hell of a Christmas party in a beautifully shot and timed sequence that proves how well they can handle their liquor – everyone else singing “Oh Christmas Tree” are soused out of their minds. But there’s Nick and Nora, floating around the rooms, wise cracking, ordering food, drinking (of course), taking in Dorothy and then Mimi and then even Gilbert who starts confusing drunks by using the term sexagenarian (“A sexagenarian? But we can’t put that in the paper.”) Nick escorts Gilbert out easily and amusingly, by grabbing his hat and walking towards the door as Gilbert exclaims: “Hey, that’s my hat!” To which Nick says, “Come and get it, while it’s hot.” Why this is both so funny and so graceful is almost mysterious in its simplicity, effortless but not effortless. It’s just as Roger Ebert said of Powell: “William Powell is to dialogue as Fred Astaire is to dance. His delivery is so droll and insinuating, so knowing and innocent at the same time, that it hardly matters what he’s saying.” Well, it does matter, particularly in the later My Man Godfrey where Powell says, “The only difference between a derelict and a man is a job.” but I entirely understand Ebert’s point. 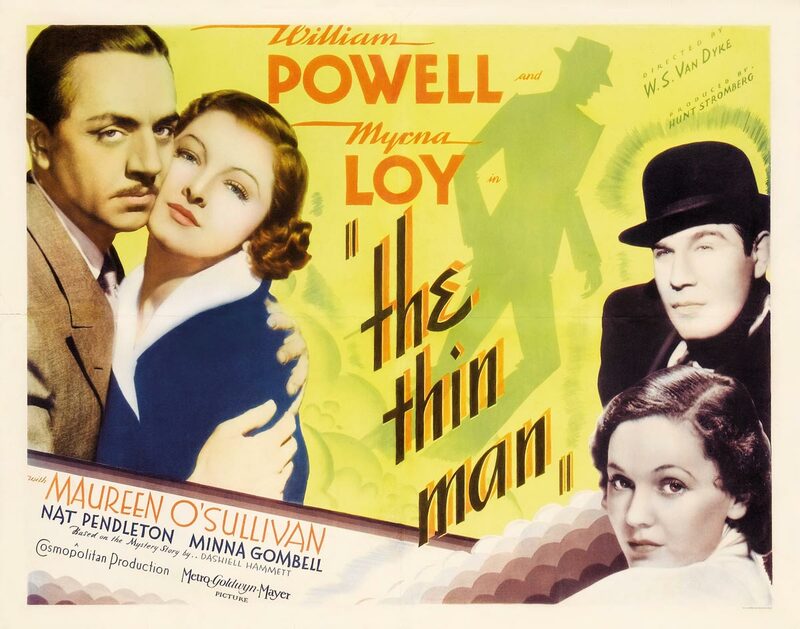 Much of the joy is merely listening to Powell, which makes all of the sequels to The Thin Man and, particularly, the Lux Radio Theater versions, so enjoyable and such an art form, and one nearly lost. Myrna Loy also makes it look all so easy. Loy hadn’t been this funny yet, and had often been cast as the “exotic” or the vamp, which she is not here, but she is most certainly not the opposite – “normal” long-suffering wife, arms akimbo waiting for her hubby to finish his latest shenanigan. She’s right there with him – joking, sleuthing, drinking. Loy had previously starred with Powell in Van Dyke’s Manhattan Melodrama (their first of fourteen films together – six being the Thin Man pictures) and their chemistry was so perfect, so natural, like two people who finish each other’s sentences, that many fans thought they were a couple in real life. Loy is crisp and sweet, elegant and goofy and bemused, never annoyed – quick to make a playful sour face or sit patiently on Christmas morning (in her new fur coat, no less – their lounging clothes are spectacular here) as Nick horses around with his present – a B.B. gun – he’s lying on the couch and taking shots at the Christmas balls on the tree. You know, every day Christmas morning things. “You act as though it were the only Christmas present you ever had,” she wryly observes. It’s a lovely, almost subversive little moment of their lives together – these two adults who’ve bonded, not by children (unless you count Asta), but by fun that verges on the precipice of irresponsibility. But who are they responsible to? Each other. And are they letting each other down? Not a chance.